Ray King’s goalkeeping career lasted 11 years. He began playing for Newcastle United, but spent most of his career at Port Vale, helping them reach the FA Cup semi finals in the 1953-1954 season. In 1954 he played for the England B team against Switzerland. It is with tremendous sadness that I have to tell you and all the Ambler community that my dad, Ray King, passed away yesterday afternoon, 19th July. He was one month shy of his 90th birthday. He was the kindest and most gentle of men and a remarkable husband and father. Since my mother Norma passed almost 5 years ago my dad, as you know, has been living with me here in Bangkok. Fortunately I have been able to provide him with a very comfortable life and I know that he has been so happy here. He has continued to write regularly for the Bangkok Post, sharing his prodigious knowledge of football, especially the game of the 40s, 50s and 60s and also commenting on the game of today. In his last letter to the Bangkok Post he predicted that Germany would win the World Cup in Brazil. His phenomenal memory never ceased to amaze me as he would reel off the names of all the players, the positions they played in and provide a mini-biography of those hundreds, if not thousands, of footballers he played with and against. My dad was one of those rare individuals who was at the very least good at any sport that involved playing with a ball. He was a good tennis player, a respectable golfer, a very good snooker player, an excellent table tennis player, a superb cricketer and of course his genius as a goalkeeper needs no superlatives. I know that many of the Ambler readers will miss the Ray King column in which he wrote about his life, others’ lives and often just shared some words of wisdom from his vast experience. He always enjoyed reading the Ambler as it gave him some contact with the town that was his home for so many years and he was always especially grateful to the readers who would write to him. He would so often tell me about his life as a young child at the Low Hall, then Radcliffe and subsequently Lindisfarne Road in Amble. He always wondered why he was clueless at maths whereas his son became a mathematician. I was never much of a footballer and couldn’t even get in the school team whereas my dad was playing for Newcastle United in front of more than 60,000 fans at St. James’ Park when he was just seventeen! 10 thoughts on "Goalkeeper Ray King dies aged 89"
A wonderful eulogy for a wonderful man, very heart warming to see a son paying such a touching tribute to his dad. Sending you sympathetic condolences from County Durham. I met Ray 17 years ago when he published an artical in the Northumberland Gazette, rounding up young goalkeepers offering his training and support. I can honestly say I wouldn’t have been half the goalkeeper I was without this mans inspiration to the position. My mother bought me Ray’s book, “hands, feet and balls” where we all star in the centre pages, along with his inspirational journey to becoming the professional he was. 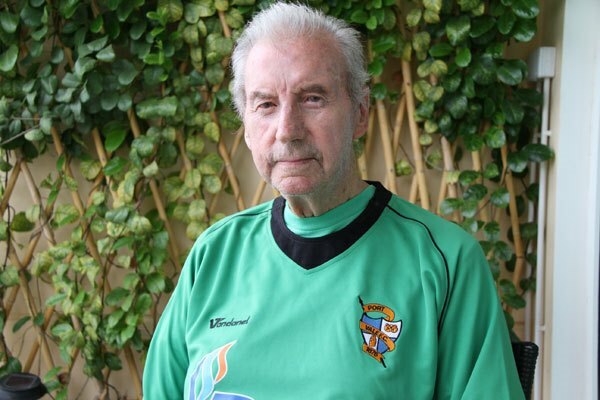 I plan to start my own goalkeeping school in the near future and would like to dedicate the scheme to Ray. On behalf of the Port Vale site onevalefan, I’d like to pass on our sympathies to you, your friends and family. Ray was a genuine Port Vale legend. I had the pleasure of speaking to Ray for an interview back in 2000 and he was polite, courteous and willing to help. In fact, what should have been 10/15 mins turned out to be an hour-long phone call – perhaps because he seemed to enjoy talking about his time at Vale Park. I was privileged to be able to listen to his account of his role in Port Vale’s greatest-ever season. Ray was a genuine Port Vale legend and his contribution to our football club will never be forgotten. On behalf of Port Vale supporters may I offer my condolences. My father who passed away a few years ago said what a great goalkeeper he was. He was major part of our great iron-curtain defence in 53-54 and will be a Vale legend for all time. May he RIP in the knowledge of his wonderful contribution in all aspects of his life. Sincere condolences Gary, I am genuinely sad to read of Ray’s passing. Your dad was a hero of my own father (who like me, was life-long Vale supporter) and as I am now 66 years old, I too, was lucky enough and privileged to have seen him play ‘in the flesh’ for Port Vale. A fantastic team player and magnificent goalkeeper (in the days before oversized gloves!) and a truly genuine PV hero. My condolences to you and your family, Gary. I met Ray at a function at Port Vale when he was one of the guests of honour. I asked him for his autograph and had a little chat with such a wonderfully warm fellow Northumbrian. I was very good friends with his understudy at Vale, Ray Hancock – I worked with his wife for a number of years – and Ray had nothing but praise for the man who kept him out of the Vale team for all those games. Not a hint of envy or jealousy, just genuine warmth and affection for a great player and friend. My sincerest condolences, Gary. I am genuinely saddened at the passing of your father and my boyhood hero. As a youngster I used to watch and idolise Ray from the Lorne Street wall at Vale Park. I didn’t miss a home match in the record breaking 1953/54 season during which your father only conceded 5 goals. I have supported Port Vale ever since, still follow them today and your dad is my favourite all time player. I proudly own a dedicated copy of his excellent book “Hands, Feet and Balls” – Ray had no need for a ghost writer, proving that his talents weren’t confined to the football pitch. I am sure that if he had been playing today he would have had no time or requirement for an agent! Your father and the team of 53/54 are still fondly remembered in the Potteries and the 60th anniversary of their achievements has recently been celebrated with the production of a limited edition mug that has been sold to raise funds for two local charities – the Donna Louise Trust and the Douglas Macmillan Hospice. May he rest in peace in the knowledge that memories of his achievements are still being used to positive effect. My condolences to you .I read Rays column with interest as an Amble lad myself .so condolences from Pattaya . I played with ray at boston united round about 1958. I played in the reserves mainly but probably 20 times in the first team when ray was our goalkeeper and also the manager. here in 2016 I have only just found out about his loss going down memory lane on the net. tributes from a son to a father don’t get any better than his and I found it very moving.wll done gary. I found ray a great guy and have to say he helped me a lot and had much respect for him.rest in peace.